Today’s project – scraps of pallet wood that I had lying around the garage and Danish oil finish. Had to readjust the gap between the bottom plank and the beam holding the bottles (the glasses wouldn’t fit in) otherwise would have finished it faster. Thanks for looking. Great looking wine holder, never would have thought of that in a million years. Really nice. Definitely a favorite. 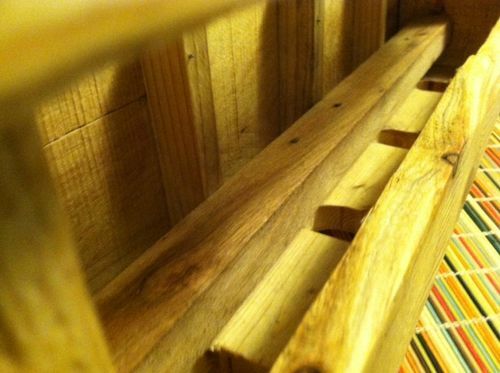 Pallets and wine….who would have thought! nice work. Maybe I should elaborate a little more on the design. I didn’t just cut a pallet in half, although I suppose that’s a possibility too. I used three beams from the same pallet, then nailed random planks to the back. I used a wider plank for the top shelf. For the front, it was either using two cracked planks or pulling apart another pallet, so I went with the first option. I think it adds to the rustic look, plus you can see the wine labels. There are two half-beams (approx. 1×2) that I pocket screwed to the vertical beams. These are what the wine bottles are sitting on. I also glued vertical “spacers” to the back plank to sort of space the bottles evenly. Finally, I routed eight 1’ slots in the bottom plank about 3/4 way to the back. I started with 5/8’ but those were too narrow for the glass stems. 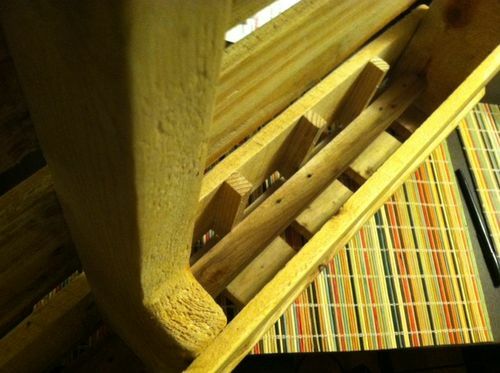 Also make sure there is enough clearance between the bottom plank and the bottle support beam (at least an inch). Will post a picture of the inside when I get home. Again, thanks for looking.